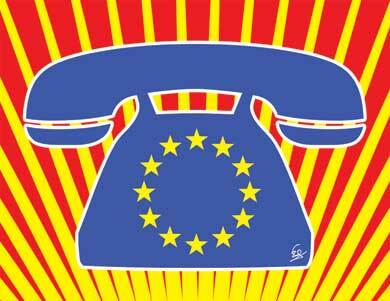 A recent cartoon in The Economist showed Catherine Ashton sitting behind a desk with five telephones. The problem is many people still do not know who Ms Ashton is, what she does or what she looks like. Worse, perhaps, most people don’t give a damn. The cartoon was an allusion to Henry Kissinger’s famous quip: “Who do I call if I want to call Europe?” the former US secretary of state once said, in a remark that drove home the old continent’s lack of a single voice. Little has changed since then. As membership has ballooned to 27 states, the European home has remained little more than an amalgam of national fixations, as nation states are reluctant to give up serious chunks of sovereignty. The Lisbon Treaty, the European Union’s last piece of institutional engineering which was propelled into being in late 2009 following a decade of tedious horse-trading and frustrating setbacks (including an embarrassing rejection by Irish voters in a public referendum), was supposed to change all that by installing a president of the European Council and a foreign policy supremo. However, the subsequent decision to appoint a duo of political lightweights — former Belgian Prime Minister Herman Van Rompuy as president and Baroness Ashton, a British Labour peer, as high representative for foreign affairs and security policy — quickly dampened the hopes of Euro-optimists. It was like wishing for the job to be done badly, critics scoffed at the time. A joke circulating in the corridors of Brussels, The Economist reported, has Ashton informing Hillary Clinton that she now has a single telephone number so that Washington can reach Europe, but when the US secretary of state finally does so, she gets a message: “For French foreign policy, press 1. For British policy, press 2…” Few Europeans would disagree about the switchboard analogy (though, to be fair, #1 should connect you to Berlin). “We have installed too many phone lines,” said Panayiotis Ioakimidis, professor of international and European studies at the University of Athens and a member of the local ELIAMEP think tank, during a recent discussion at the Foreign Ministry in Athens. “We have five presidents speaking for Europe and that spells confusion,” he said. New posts keep springing up, making the EU look like the Lernaean Hydra of institutions. Next to Van Rompuy and Ashton there is Jose Manuel Barroso, president of the European Commission, Jerzy Buzek, president of the European Parliament, and Jean-Claude Juncker, president of the Eurogroup. The Lisbon Treaty — which followed the ill-fated EU constitution and the Maastricht, Amsterdam and Nice treaties — was designed to make the bloc more effective, more visible and more legitimate. But success has so far been minimal on all levels. By installing a two-headed presidency, the new blueprint has institutionalized the EU’s split identity at the highest level. Undefined and overlapping duties between the top dogs have occasionally resulted in turf wars while the excessive number of presidents has given the EU more visibility — but not in the way it had hoped. The treaty has at least strengthened the role of the bloc’s perennial underdog, the European Parliament, but has not necessarily made it more democratic. The MEPs may be elected but they are hardly accountable: They are little known to ordinary citizens while the impact of their decisions is limited. Impact is also wanting on the global scene as the Union’s diplomatic power is no match for its economic clout — the EU is after all the world’s largest trading bloc. A self-styled champion of freedom and human rights, Brussels has come under fire for its sluggish response to the pro-democracy riots in Tunisia and, more recently, Egypt. “The Tunisians are not going to postpone their revolution for a year so that the EU can issue a response,” Piotr Maciej Kaczynski of the Center for European Policy Studies, a Brussels-based think tank, told the Foreign Ministry discussion. Nor has the new setup been very impressive in handling the euro crisis. Worse for the federalist technocrats in Brussels, developments like Greece’s near-default and the creation of a bailout mechanism for Europe’s spendthrift countries have shifted power to the governments in Berlin and Paris. “Expectations were too high,” said Janis Emmanouilidis, senior policy analyst at the European Policy Center in Brussls. He said some Eurocrats tried to sell the product beyond its real value. “This is obviously not a perfect treaty. However it is the treaty we have to live with for a certain period of time and we have to make the most out of it,” Emmanouilidis said. It is still too early to judge the EU’s new rulebook. The new equilibrium will take years to consolidate. Unlike Ashton, who seems to have been reduced to switchboard operator status, Van Rompuy is still testing the system to see how far he can go. The Greek debt crisis, where he deftly bridged the original divide between France and Germany, and Belgium’s presidency in the second half of 2010 were a wind of political Fortuna which won him considerable credit. Many critics underestimated the Belgian, Emmanouilidis said, but we should keep in mind that he started from scratch. It is important that the first occupant defines the post for the next generation of council presidents.